Conformance with the Quality Standards is evaluated based on results from laboratory testing according to the Quality Test Method (QTM) in the latest edition of the International Electrotechnical Commission (IEC) Technical Specification 62257-9-5. 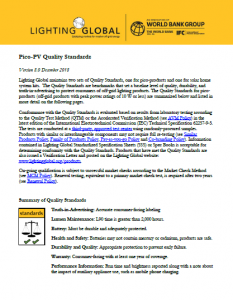 Products that have met the Quality Standards are issued a Specifications Sheet and Verification Letter and posted on the Lighting Global website: www.lightingglobal.org/products. Current and previous versions of the Quality Standards may be downloaded below. View this Change Log to see what changed when in each set of quality standards. A recent version is also available in Chinese (中文版), and French (français) for informational purposes. In case of a discrepancy, the English original will prevail.